BBC NEWS | Business | Big Brother at the supermarket till? The chips can also indicate when a CD is stored in the wrong shelf. This could mean that retailers have fewer empty shelves, and suppliers can eliminate wasteful overproduction of their goods, say supporters of RFID. However pressure group Consumers Against Supermarket Privacy Invasion and Numbering (Caspian) is urging people to restrict their purchases at Tesco. 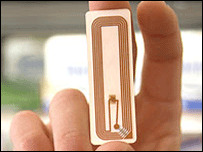 It claims RFID chips can be used to secretly identify you and the things you're carrying or wearing. All kinds of personal belongings, including clothes, could constantly broadcast messages about their whereabouts and their owners, it warns. What is the RFID hype all about? "We believe Tesco's decision to pursue item-level RFID tagging is irresponsible," says Caspian director Katherine Albrecht. Ms Albrecht claims Tesco's RFID move "would involve potentially hundreds of thousands more shoppers... it essentially means that more people will be taking home items containing spy chips". Analysts point out that the technology is years away from being able to function in such a sophisticated way: although it is already starting to be applied to logistics operations, consumer goods are unlikely to be tagged on any scale until 2010. And Tesco says the tiny devices, fitted to the cellophane wrappers on products, can be simply thrown away by the consumer after opening. They also say the radio-barcode on the devices can only be read when in close proximity to a checkout "reader" located in the store. "Suggestions we would use these to track people or monitor them after they have left the store are simply not true,"
There was controversy in 2003 when a RFID tracking system was used in the packaging of Gillette Mach3 razor blades to stop shoplifting at one of Tesco's Cambridge branches. Anyone picking up a packet of the blades triggered CCTV surveillance of themselves in the store. And those who support the new technology say it could help improve security, at a shop floor level and distribution level. Tesco has signed a deal with ADT, which will supply 4,000 RFID readers and 16,000 antennae to it by autumn, with 1,300 UK Tesco supermarkets and 35 distribution centres getting tracking equipment. The company says says the technology will be used on things like trays and palettes, and not on individual items. This is totally separate from the Leicester trial, Tesco insists. Marks & Spencer is another UK retailer experimenting. The firm has been running an RFID tag trial on men's suits at nine stores, including in Oxford Street, London. It says this is solely to "monitor improvements to stock availability in the supply chain from supplier to store". 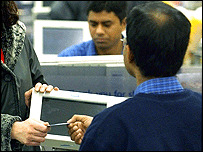 RFID was pioneered in the US at the Auto-ID Centre in Boston, a partnership of around 100 global companies, including Wal-mart, Tesco, Nestle, and Pepsi. The centre has now been superseded by EPC Global where research continues... as does protest in the US. Utah's House of Representatives has passed an RFID privacy bill, which requires all goods carrying functioning RFID tags in stores to be labelled as such. But, according to Tesco: "The impact to the supply chain, to our stores, our staff and most importantly to our customers will be enormous, and all for the better." Q&A: What is the RFID-hype all about?